Remember the Star Wars Trilogy, which had all the spectacular sci-fi imagery? We were amazed as we watched the big screen and heard the beeps and saw the light show; there was so much that captured our attention. Similarly, the start of the U.S. 116th Congress is starting with galactic fireworks. The first proposed legislation introduced in the House is by Rep. Sarbanes (D-MD) and co-sponsored by Rep Pelosi (D-CA). The bill, H.R. 1 and titled, To expand Americans’ access to the ballot box, reduce the influence of big money in politics, and strengthen ethics rules for public servants, and for other purposes (aka short title: For the People Act of 2019) is expected to have a final floor vote in late January or early February. The bill, in part, pulls from several existing proposals and includes many new provisions that promise to be as exciting as Star Wars with all of the bells and whistles. The magnum opus of H.R. 1 includes three main areas: campaign finance, voting rights, and anti-corruption/ethics laws. H.R. 1 requires more disclosures for political spending by corporations, labor unions, and super PACs, (HR 6239), establishes tax credits (HR20) and includes measures to strengthen oversight of lobbyists and foreign agents. The bill incorporates voting rights measures from (HR 2978) as well. According to Carson and Kase (12/31/18) in their article entitled “Why Same Day Registration is Critical to the Success of HR1,” the legislation “includes a variety of improvements and necessary measures to fix problems with our elections: restoring the Voting Rights Act, ensuring fair redistricting processes by ending partisan gerrymandering, expanding Automatic Voter Registration, and much more.” H.R. 1 proposes passing the DISCLOSE Act and the Honest Ads Act (requiring Facebook and Twitter to disclose the source of money for political ads). H.R.1 includes making Election Day a federal holiday and responds to the Supreme Court’s Citizens United ruling, which declared political spending a First Amendment free speech. Under the ethics law reform section, H.R. 1 also strengthens the Office of Government Ethics’ oversight and enforcement authority. H.R. 1 goes as far as creating new ethical standards for the U.S. Supreme Court. Oh, the list of provisions is long and H.R. 1’s 500 plus pages are comprehensive. According to Pelosi’s Facebook post on 1/4/18 – “House Democrats are keeping their promise to the American people by unveiling H.R. 1, which they consider a historic reform package to restore the promise of democracy, end Washington’s culture of corruption, and reduce the role of money in politics.” This tall order bill suggests an urgent need for change or at least a return to a state of normalcy. However, its wide-reaching agenda will encounter much opposition. Surely House Democrats understand that it is unlikely that H.R. 1 will pass in the Senate or signed into law by the President. Perhaps they are using the bill to set priorities or build a congressional record for strengthening U.S. democratic institutions. However, with over 200 years of democracy under our belt, thousands of laws and policies, and a system of checks and balances in place, why the for need sweeping democratic reform? Something is amiss! As Luke Skywalker searched for his father’s true identity, we need to search our democratic values and answer the question, who are we as a nation? Just as Luke, Princess Leia and Hans Solo prepared for battle against Darth Vader and the dark side, H.R.1 prepares to fight against super PACS and big money donors governing our agenda and Washington corruption. If H.R. 1 seeks to strengthen laws that weaken and dissolve fair treatment and equity, then how were they dismantled? Who did it? 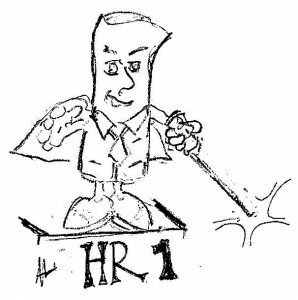 H.R.1 will give the people their voice back—did we know it was missing? H.R. 1 will give democracy back to the people—who took it from us and when? Is Washington politics involved with sleight of hand? No, it’s all happening in plain sight. Let us hope that H.R. 1 is more than symbolic; that it will be real transformative change. For that to happen, H.R. 1 will need to change the culture of politics, the process of elections, and strategies for achieving social equity. Based on the American public outcry, it is clear that H.R. 1 is necessary, but will it be sufficient to make a real difference in our current political and social climate. Passing H.R. 1 into law will be a spectacular Jedi fight and tickets are available, but be more than a spectator. U.S. citizens, arm yourself with the lightsaber of knowledge and engage with your representatives to ensure you have more than a front row seat. Use the power of the vote, lobby for laws that benefit the working class, attend town halls and run for office. It will take all of us to keep our democracy safe and ensure our government remains of, by, and for the people. May the Force be with us. There is also a ‘Dark Side’ to this very partisan bill sponsored by Rep Sarbanes and Pelosi, including a constitutional amendment to end Citizens United, the conservative organization that supports traditional American values. And, do we really want to make voting ‘automatic’ for everyone? I think a vast majority of us are quite comfortable with voter registration and mandatory ID at the polls. Also, Sarbanes is happy to spend your tax dollars to include a 6X match of federal dollars for every dollar contribution on your ballet. Disclosing sources of campaign finances is a good thing, but this bill clearly has some extra baggage. Blatantly political screeds like this are detrimental to the ASPA. The author seems oblivious to the distinction between politics and administration.